Our flight would leave at 2:35pm today, so we knew we would have to leave (sadly) the luxury of the Imperial Hotel. 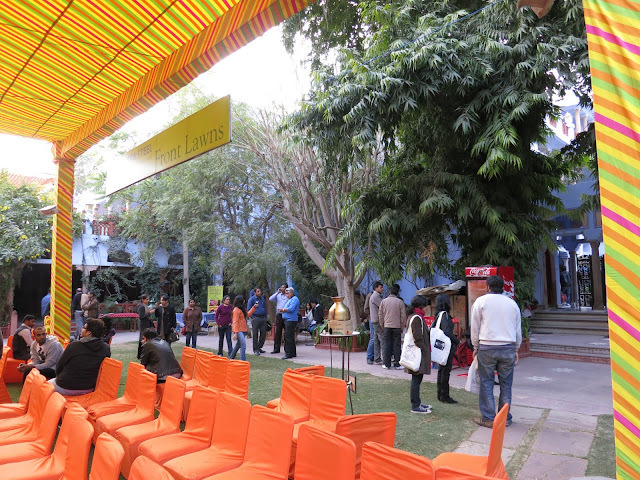 We decided to walk to Connaught Place right near the hotel. There were some stores located there and we wanted to check them out; our final shopping opportunity before we left for the airport at noon. When we left the hotel, and started walking our way was blocked by Metro construction. Immediately many different men came up to us, telling us how to get there. Each had a slightly different story and we intuitively felt they were shills trying to get us to their uncle’s store. We walked for a while, trying to find the shopping area. Finally one very nice young man, started to talking to us we trusted him. He wrote down where we should go, hailed a rickshaw for us and negotiated a 20 rupee fee for him to take us to the store and wait for us and take us back to the hotel. The rickshaw driver was very helpful, spoke excellent English and drove us around the construction to a block that had several stores where we bought shirts at $ 10 each after successful bargaining. 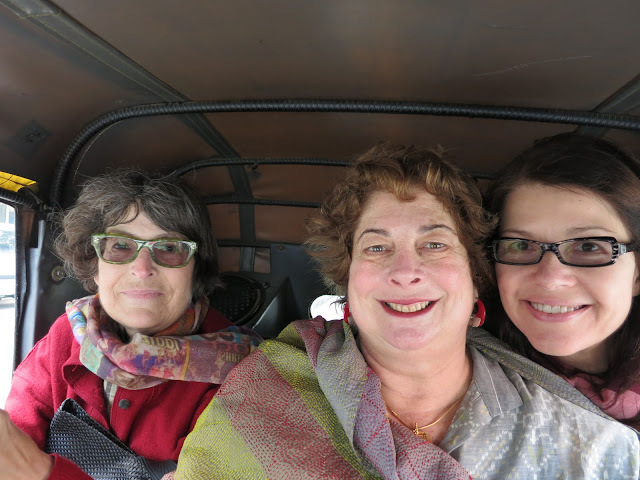 We drove to the airport (our new favorite airport in the whole world) and flew uneventfully to Jaipur, the Pink City, where we will be attending a 5 day literary festival. When the plane arrived we went to reclaim our luggage and we had a typical Indian Experience. There were only two luggage carousels and it wasn’t announced which one our luggage would be on. Every time the one of carousels started spitting out luggage everyone would run to that one. Then the other one would start spitting out luggage and everyone would surge to it. Eventually we were all rewarded with our luggage. We were met by our driver, who had been with us on a previous trip to Rajasthan. He will be with us everyday driving us back and for to the conference or out to dinner or shopping. It is nice having a chauffer especially in Indian traffic! He drove us to the conference location the Diggi Palace, where we decided to check it out. It starts tomorrow. It reminded me of a typical pre-wedding scramble, workers everywhere pulling things together, trying to get lights, banners and chairs in order. We were, however, able to secure our badges for the event and the final the event. There is much security at the event, because Salmon Rushdie will be there and the Death Fatwa on him is still in effect. Ophra also will be there. There must by 100 difference talks and events, it will be hard to choose. 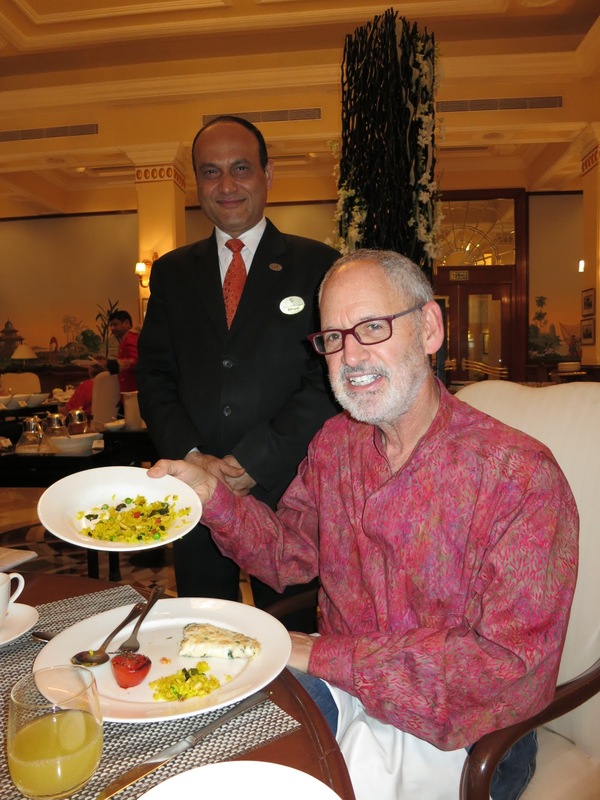 We then went to our hotel, the Samode Havali. We have stayed here before. It is an old mansion that has been converted in a hotel. We had typical events checking in, our original room was very nice but on the 4th floor with narrow steps to get to it compensated for by beautiful decks overlooking the grounds. We instead chose a closer ground floor room. We put our valuables in the safe and locked it. I then tried to retrieve them to get something I needed and the safe wouldn’t open. Long story short: they used the secret way to get into a hotel safe, declared the safe battery needed to be replaced and later on they fixed it. In the interim I had all our valuables in my backpack with me as we went to a well-deserved drink. The hotel does have a near fatal (for me flaw). No internet in the room, very spotty wifi in the open to the cold night air lounge. It was quite a scene, all of these people from around the world bundled up with heavy coats laptops, ipads and smart phones in hand trying to get on the internet. Most were having no success. In the old days they all would have been there reading an Agatha Christie novel, now they surf the net. We ate a wonderful Indian dinner outside under two gas heaters and then proceeded back to our warm wifi-less room. If you are interested in the Jaipur Literary Festival Details that we are participating in here is a link to it: Literary Festival.